On 18th March 2017, we, Brunei Biotope Group, were off again on another journey into the Labi jungle of Brunei in hopes of finding something exciting. On this trip our group of four people were heading towards Teraja Waterfall, a widely known fall along the Sungai Teraja which is frequented by many tourists, especially those which like to go on jungle adventures here in Brunei. 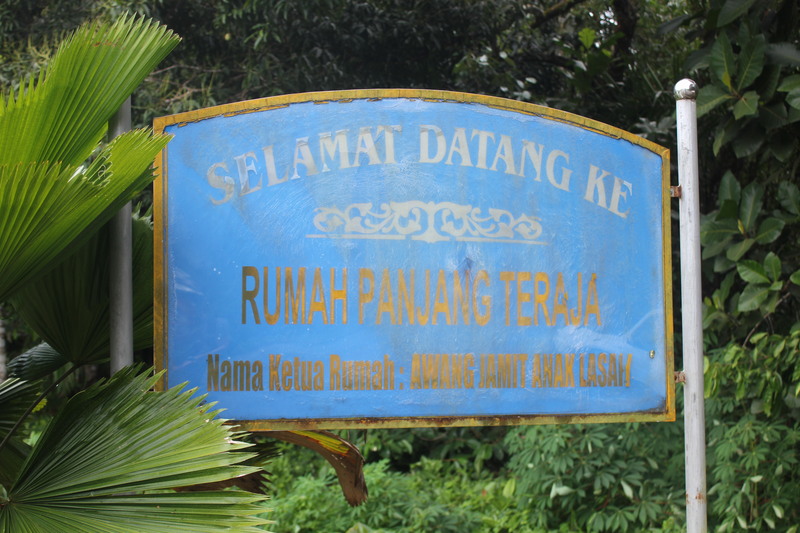 We started our journey from Seria Town at 09:00 AM and we had arrived at the Teraja Longhouse at about 11:00 AM. As we arrived at the Teraja Longhouse, we informed the Iban people (head hunter tribe) living in the Longhouse that we were on our way to Teraja Waterfalls and asked for permission to pass through the back of their house as it is the only means by which anyone may enter the Teraja part of Labi jungle which has a path. The Teraja waterfall is located at about 1.7 kilometers from the Longhouse As we were on our way to the Waterfall, we met a lovely married couple, Susanne Schaeftlein & Dietmar Mueller, expats from Germany whom have recently moved to Brunei for work purposes; Mr Mueller as a Geologist. Since they were also on their way to Teraja Waterfall, I politely asked them if they would like to join our group, and so they did. We stopped at certain areas along the Teraja river as Mr. Mueller had a Camera with a tripod along with him. 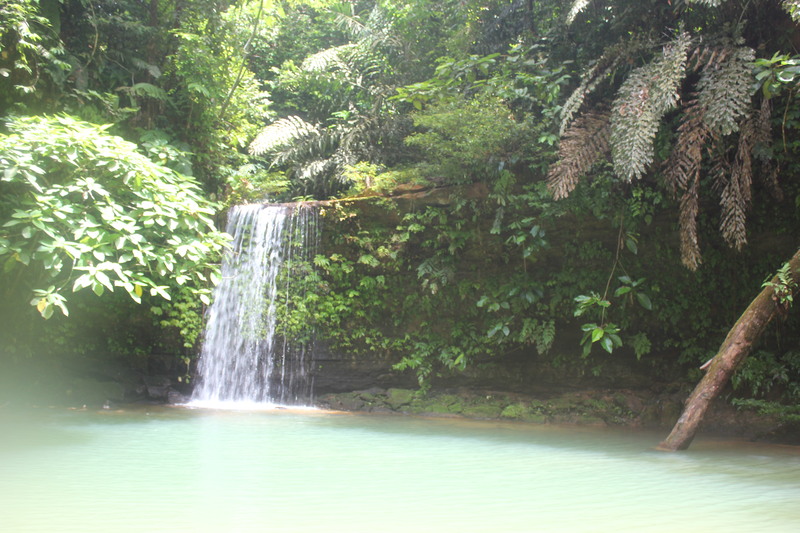 When we finally arrived at the Teraja waterfalls, the colour of the water was blueish. 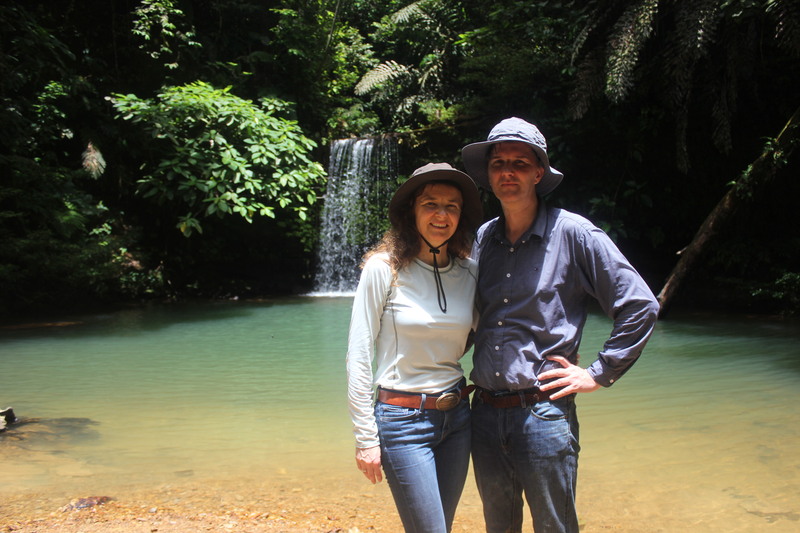 The married couple spent their time swimming in the cool waterfall pool, while we from the Brunei Biotope Group mind our own business & record as many fish specimens as we can in the Waterfall pool. Along the way to the Waterfall, only I experienced leech attacks, twice, once from a water leech, & the other from a Tiger Leech (Haemadipsa picta) which thankfully did not yet bit on my skin; I then proceeded to catch the fishes using a drag net & took photographs of them. 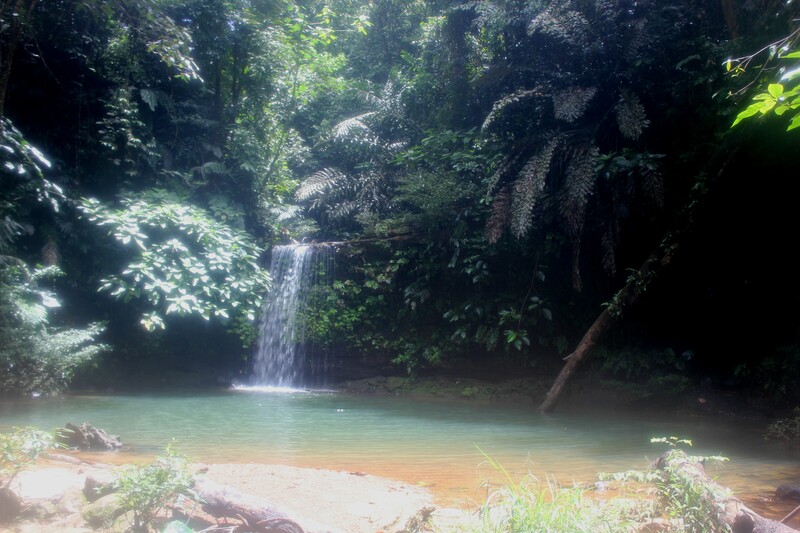 At the Teraja Waterfall (located at 4°17’15.86″N, 114°25’49.97″E), I 1st recorded several videos before trying to walk around the area & making the water cloudy from the substrate. 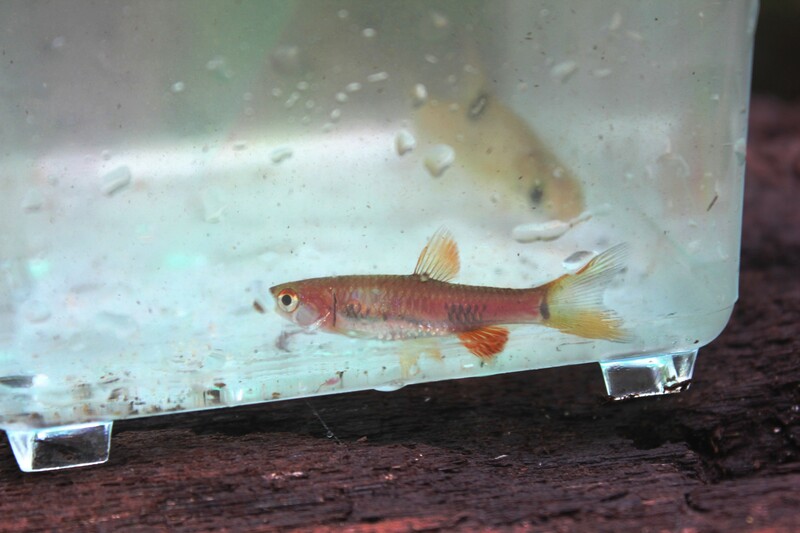 While recording the video, I observed a marvelous sight where various species of fish were schooling together, the species which can be seen were, Barbodes (Puntius) binonatus, Rasbora cf. 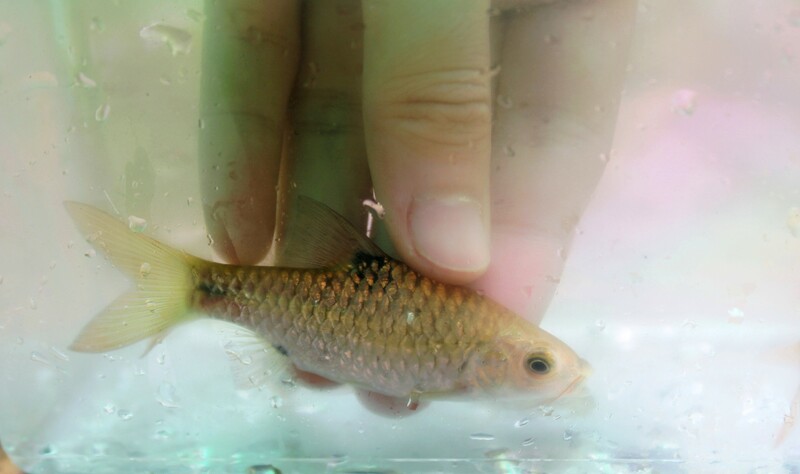 tornieri which, Rasbora cf. cephalotaenia & at the same time I observed a fish which were grazing on the surface of the rock, it was Osteochilus waandersii , it seemed as if it was grazing on the algae on the rocks, an important observation; I also saw a freshwater crab in the pool. 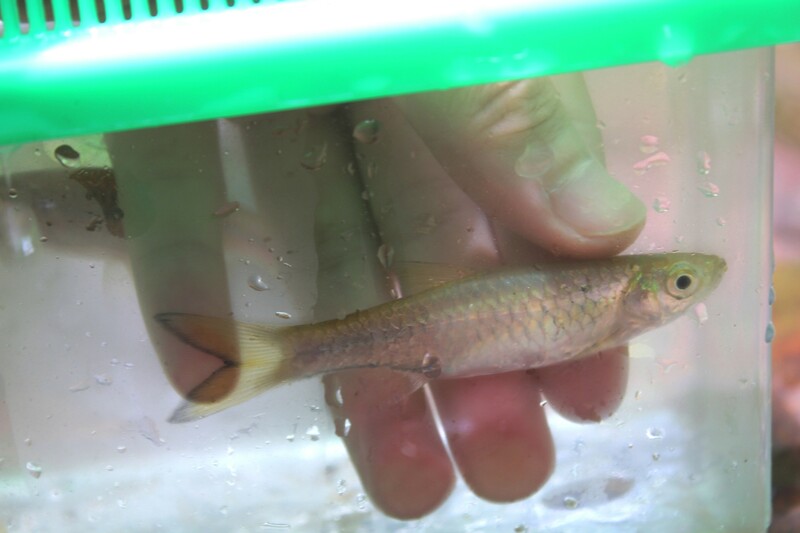 While trying to set traps on the banks of the pool, I noticed 3 more species which I did not see schooling with the other fish, which were Desmopuntius johorensis, Hemiramphodon pogonognathus & Rasbora kottelati; unlike at Sungai Belulok there were not many Macrobrachium here at the Teraja falls. 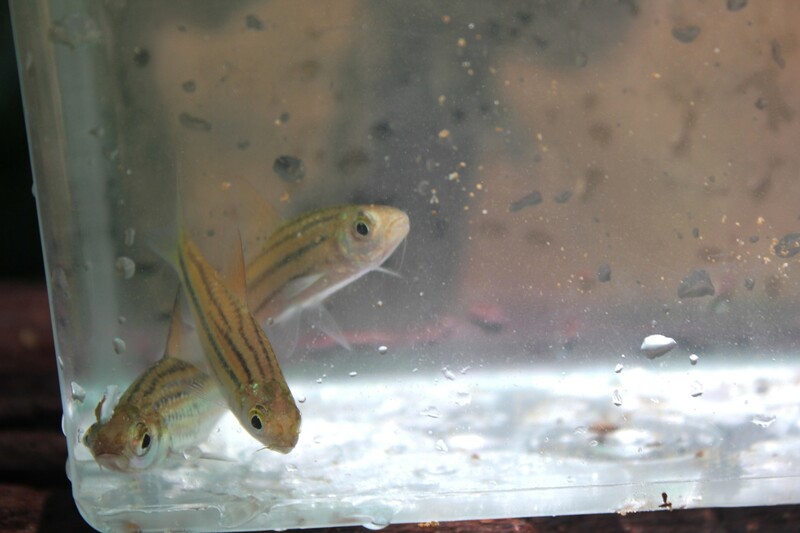 Temperature: 24°C – 25°C, pH: pH 6.5, Water Depth: 15cm – more than 2 metres nearer to the centre of the Waterfall pool, Substrate: Sand & Clay from the surrounding cliffs, Nitrate & Nitrite: 0 While trying to catch our specimens, the married couple then said farewell. We then packed our equipments at 2.30 PM, & arrived at our car at 3.10 PM. That marked the end of our journey for the day. Teraja Waterfall is situated at 4°17’15.86″N, 114°25’49.97″E and Belulok Waterfall can be found at 4°16’32.57″N, 114°25’29.45″E, both are only about 1.5 km from each other and yet there are several species which can only be found in one river and not in the other. 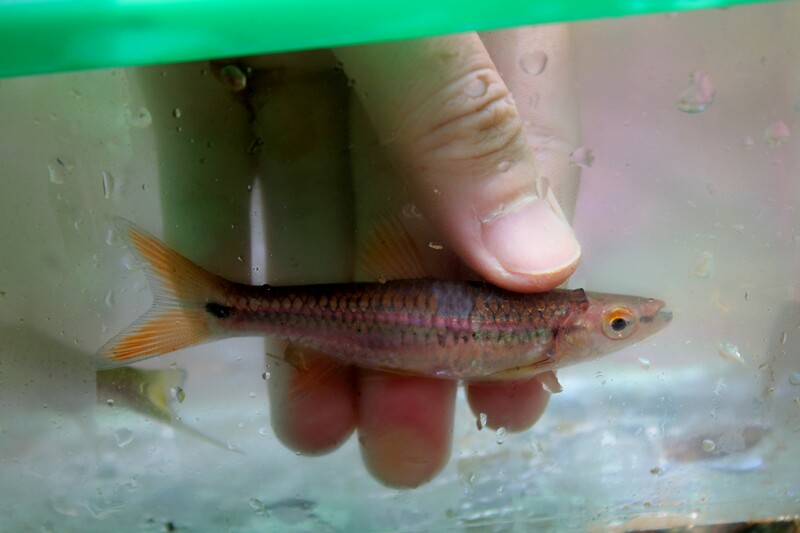 For example, Desmopuntius johorensis, Osteochilus waandersii & Nemacheilus olivaceus could only be found at Teraja stream in Labi (as for the moment) and Desmopuntius pentazona, Rasbora einthovenii, Nandus nebulosus & an unidentified species of Silurid catfish could only be found at Belulok stream.